Starting as early as next week and going until June, Metro and SDOT will be installing new bus only lanes in two north downtown corridors. 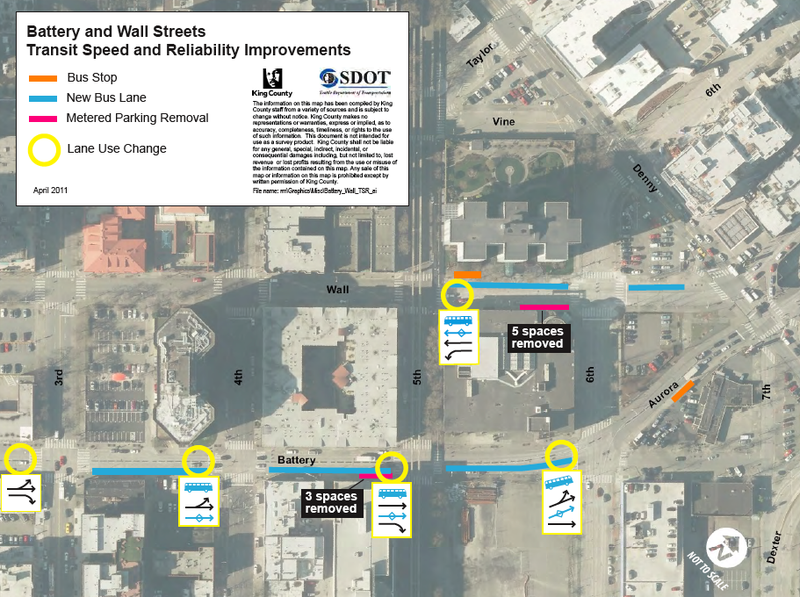 The first project will install a 24/7 bus only lane on several blocks of the Battery St/Wall St couplet between 3rd Ave and Aurora Ave N. This project also includes a queue jump at the intersection of 5th and Wall, to help buses entering downtown merge to the far left lane to turn southbound onto 3rd. These improvements will be used by the 5, 26, 28, and 358, which combined carried ~25K riders a day in 2009. 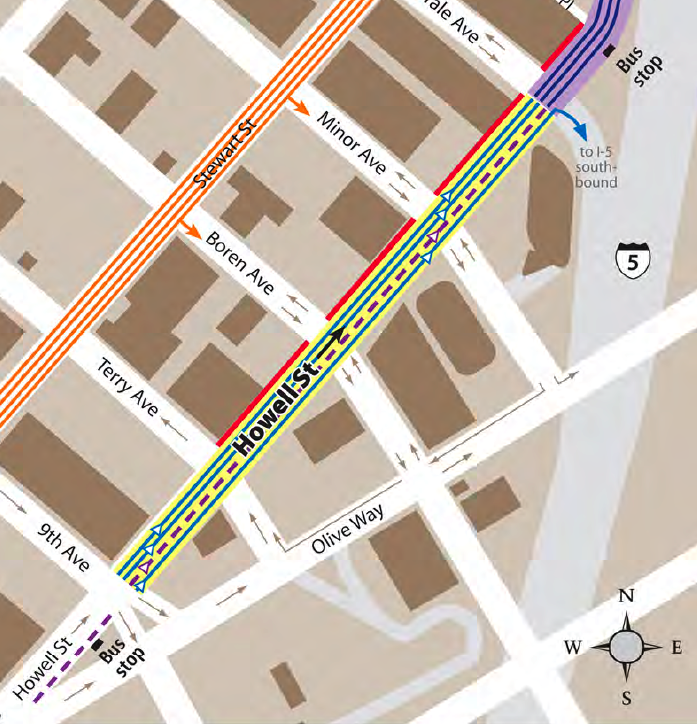 The second project is a new peak period (3-7PM) transit only lane on Howell St from 8th Ave to Yale Ave. This transit only lane will be in the right center lane of Howell St. The problem with Howell St is general purpose traffic trying to get onto I-5 southbound at Yale Ave. The signal at this onramp creates long queues on both Howell St and Denny Way, trapping buses heading to the I-5 express lanes or Eastlake Ave. Approximately 60 buses an hour operate on Howell during the PM peak, carrying over 1,200 passengers an hour. Enforcement at this location will likely be important and the intersection of Howell St and 9th Ave may continue to be an issue since buses and I-5 bound cars still must weave at this intersection. Both of these projects are low hanging fruit and frankly should have been done years ago. It’s good these projects are finally getting attention and it would be nice to hear from riders than will be affected by these changes. Wow no one has anything to say about these projects? I write about some 100% transit goodness and not a single comment in support? Come on people. Well, I kinda beat you to part of it. I posted about the Howell St project and raved about how it will improve the 66 on the open thread before last. I vigorously support all of these projects, although I have no particular insight into the Wall/Battery couplet. There’s also no raging controversy about any of them either. I suspect most people clicked the piece, nodded their head in approval and went on their way. I bet that is what happened, but people that can make things happen read this blog and they need to know that first off they need to do more projects like this, second we strongly support these projects, and third there will be less blowback than they think. You’re absolutely right, of course, although if that’s partly your purpose, you might want to put some inoffensive call to action (“Do you ride these busses? Tell us about your experience with bus traffic in these areas…” or something) in the post. I didn’t mean to come off harsh, I’m just really surprised there wasn’t a single comment for an hour and a half. Oh no, you didn’t come off as harsh, it’s just that both the subject matter and the way you wrote it up weren’t really calibrated to inspire a big response. I see. Good point. I really just focused on what the projects do. A lack of comments on any comment thread is not the end of the world. There is no need for us to be obligated to comment on any particular comment thread. Besides, some of us only visit STB once or twice a day, thanks to something called “life”. 1) You need to do more projects like this. 2) We strongly support these projects. 3) There will be less blowback than you think. I think these are a good change that should be applauded. They do fall well short of what could be done in this part of town. I don’t really have technical expertise, but for my own personal benefit, I would love to see some northbound buses take advantage of the Howell change. Maybe one or two of the 522/306/312 triplets serving the Denny triangle slu area and hopping on the express lanes on the Eastlake onramp. I was not aware of the 309. Definitely less of a hike than 6th and Pike. When it works, it will work better. Thanks! Oh, please don’t split up the 306/312/522 Lake City Way trunk line. Awesome! This will make a big difference. I’d love to see a similar sort of re-design on Stewart between Eastlake and 9th. That seems to be a major bottleneck for southbound 71,72,73 express routes in the afternoon. Yes and all non-express lane I-5 SB buses. That whole connection via Stewart and 9th Ave are ridiculous because buses going into the tunnel have *no* priority treatment getting to the tunnel. Essentially we build a tunnel with a current value of roughly a billion dollars and then didn’t take the time to make sure buses can get to entrance in a timely manner. It’s not at all uncommon for the best to take 5-10 minutes just go get past the light at Denny Way. This is especially annoying if you’re going to get off at the next stop anyway and backtrack across the same intersection on foot. Bus drivers could mitigate this substantially by opening the doors while stopped in this traffic jam if the stop light is on, allowing people who were going to get off at the next stop anyway to get off earlier. It seems that with such a highly used transit corridor, and three lanes to work with, a transit-only lane would be a no-brainer. Doing it while maintaining parking on both sides of the street might be tough, though. I wrote SDOT about that a year ago or so, asking for PM peak parking restrictions in the left lane from I-5 to 9th Ave. They said they thought the bottleneck was just from the I-5 off ramp to Denny, so they were just going to address that. Maybe continue to 9th if the problem persisted. I used to get stuck in that jam daily on the 41. Cool, next street they should look at is S Jackson St. They need bus lanes between Rainier/Boren and 4th Ave, and they need signal priority at 4th Ave. Given that SDOT will be hacking up Jackson St before too long for the streetcar, I doubt they’d want to repaint the road in the near future. They repaint the lane markings every year. They’re working on it. Not exactly what you want but the intent is the same. Thanks for that link, Oran. I hadn’t heard about Rainier Phase III or seen the Ballard/Uptown plans. Yes, more of this please. 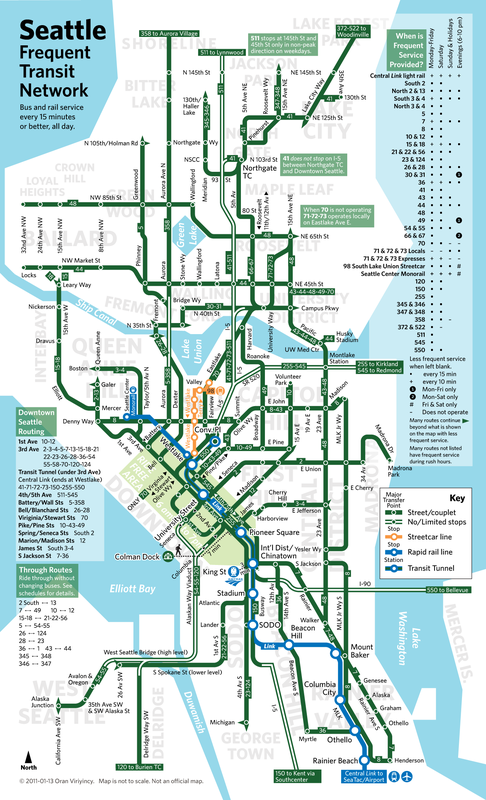 I’d like our bus-only lanes to some day look like Oran’s Frequent Transit Network map. Well, I’ll just paste what I said at orphan road. I like the transit lanes but I’m not convinced about the Howell reconfiguration. Seems like they’re only removing the westbound lane to make sure that there are just as many freeway-access general purpose lanes. Why not just extend the existing lane bus-only lane by taking away a general purpose lane? I’m not a big fan of Stewart or Howell, they’re basically just long I-5 ramps. At commute times they’re busy but the rest of the time the configuration of 4 lanes in one direction just encourages people to drive really fast and makes it more dangerous to cross. Oh, and the parking. Yeah, what the Denny Triangle really needs is more parking. The Westbound lane isn’t getting converted to a “Freeway-access general purpose lane”. It’s getting converted to parking, so it’s simply removed. This is a case where I’m not likely to complain about added parking, because it’s being used as a method to shrink the road. East of Boren, only one lane of Howell is a freeway access lane, separated from the rest by pillars running down the stripe. They did this very simple improvement a couple years back, because queue-jumpers between Yale and the onramp were worsening the onramp backup to the west, and jamming up the other lanes with freeway-bound mergers. So we’ve already reduced the chaotic freeway-bound jam to a single-file line, leaving 3 lanes. Segregating the freeway traffic has opened up the other lanes to more creative possibilities, like this. That said, this stretch of Howell has a lot of underused capacity during off-peak hours. Makes me wonder why the bus-lane is peak hours only, when the lane is unneeded for GP traffic off-peak. Unless all the lanes *are* being shrunk, converting the westbound lane to parking to “shrink the road” seems tremendously pointless, since it isn’t affecting the number of eastbound lanes. No, the 4th lane *is* general purpose during evening peak, and parking at other times. Ah, OK, thanks for the clarification. So the the net effect is trading a travel lane for bus only during peak and parking during off-peak. I’ll take it. Excellent news! I’d really like to see something similar happen along 1st Ave S and 4th Ave S to keep buses moving during Viaduct construction. I mention 4th Ave S because it would seem to offer some re-route opportunities that keep buses out of the Stadium game-day mess, and because there’s the new off ramp to 4th from the Spokane St Viaduct. I’m surprised this corridor (Aurora from Downtown to Bitter Lake) doesn’t get more play when the city talks about rail. 25K daily riders is a lot, and there is available ROW for grade separation for much of the route. I think several factors militate against any rail building happening on it soon: the length and expense of such a line, the ramifications of it being a state highway, which I think means we’d need buy-in from WSDOT, the fact that Metro is giving it the RapidRide treatment, and most importantly, everyone is going to wait and see where Sound Transit builds after Northgate. If they choose Aurora, much of the long-haul demand north of 85th St will disappear. But yes, it speaks to the tunnel-centricity of McGinn’s thinking that everyone’s talking about West Seattle-Ballard while Aurora goes unmentioned. “It requires no water crossing”? You can’t put rails on the Aurora Bridge; it was specifically designed NOT to support even PCC type streetcars, much less LRT. So it would require a water crossing. And Jack, where is the ROW south of Evergreen Washelli “available for grade separation”? The only stretch that might be usable is through Woodland Park, and I doubt that folks want one of their favorite parks turned into a high speed rail line. You certainly wouldn’t want to take the land between Aurora and Green Lake for a rail line so you really don’t have opportunity for separation north of South Green Lake Way. There is insufficient opportunity for density south of 105th and no real reason to develop since it’s in a valley with no views. I certainly agree that the north end of the Aurora corridor is a spectacular opportunity for LRT, but it needs to be tied to the main line at Northgate. It’s easy to do by hugging the south side of the cemetary over to Meridian and then bridging the gap to the Northgate TC. Interesting, I always assumed that bridge would be an easy LR conversion. If it’s not, I take back my comment and I would say that BRT is the best mode to serve Aurora. Was there any feature about the bridge that made it seem like a better candidate than other bridges at first glance? It’s not a drawbridge. There’s really no point building anything more serious than a streetcar on any ROW that’s going to close for 5+ minutes at a time without warning. @anandakos: I’m familiar with the ROW along the north side of the ship canal between fremont and ballard. It’s an ideal alignment for a streetcar. My thoughts on Aurora are many. Primarily, I’d like to see our rail dollars cover as much as the city as we can. Since ST3 is going to Ballard, does it not make sense for the city to plan a line where demand is high and ST is not? As for ROW on Aurora, a westside alignment with a dedicated bridge next to the Aurora bridge would get you to the Zoo (and get rid of blight between 37th and 46th), and then some creativity to transition to Aurora via Linden (a la 358). There would need to be some upzoning on Aurora north of 65th, but this is a good thing I think. There’s a lot of redevelopment (apartment) opportunity in this corridor all the way to 130th with strong view potential. The Battery and Wall bus lanes only benefit the 358 and 5, despite Metro’s press release. The 26/28 use Blanchard & Bell as they are heading to Dexter Ave (unless Metro plans to re-route them). The project looks to me like preparation for Rapid Ride E.
26X/28X use Wall/Battery I believe. I was going to wonder whether the 26 and 28 were moving from Blanchard and Bell… and I kind of regret not doing so, since then Adam wouldn’t have guilt-tripped some of the early commenters into commenting. Bruce is right – it’s the 26X and 28X that use Battery and Wall. I’m a 26/26X rider – I don’ think the bus lane on Wall will help the 26X all that much but the Battery lane should help a lot. In the mornings I usually experience more congestion north of Denny than through Belltown. Actually it may be preparation for when the viaduct comes down and cars won’t be able to exit in and out of the tunnel like they can get on and off the viaduct at various points downtown. More car traffic is expected on the city street grid, increasing the need to get buses out of general lanes into a complete corridor of transit lanes north-south connecting to 99 at each end of the tunnel. Metro is hoping for a transit only pathway using Battery and Wall to third, to a Washington and Main couplet, to the entrance/exit to 99 at the south tunnel portal. I currently drive the 5. Battery is frequently a huge time waster between third and Denny. I’ve been stuck there 15 minutes on the 5 at 5:30pm outbound. The problem is that Metro can get more riders if they design their bus routes to either swing south and loop around in Pioneer Square (like the 70) or be through routed with another route (like the 5 and the 54/55.) There’s nowhere to go from Belltown. This is actually why I live downtown (1st & Pike) and my next apartment will probably be in Pioneer Square (2nd & Yestler), even though there are many more, much nicer apartments in Belltown. My preferred way to solve Belltown’s lack of transit would be to build a center-running grade-separated streetcar on 1st Ave, and run it every 10 minutes or better. This would give Belltown riders a really fast ride downtown to all the E-W busses. If Belltown grows as fast at the city is hoping and its zoning permits, it will reach a point in the next decade or so when trolleybusses will no longer be able to meet the demand for transit there. It sounds ironic to talk about lack of bus service in Belltown when other neighborhoods can only wish they had the frequency of the 1/2/3/4/13/15/16/18 combined. I get what you mean, but Selma has a point about Belltown vs the rest of the “Downtown” area, i.e. extending down to (say) Jackson St. For an area so close in, its transit service is not as useful as all those routes would suggest. You may have service every 15 minutes, but if you want to go to Capitol Hill your travel time is nearly doubled due to the extra travel and a transfer at 3rd & Pike, vs the same trip from elsewhere downtown. Belltown is already the densest neighborhood and has the second and third densest census tracts in the state. Unlike the Western Slope, it is not getting a subway station next to it, and isn’t likely to for a couple of decades. It has high-rise zoning and lots of unused or underutilized lots, and the city projects it to be the largest population growth area over the next decade. It will be kind of stupid if we lure people to the city only to provide them crappy transit. More like, service every 4 minutes, at least below Cedar. The 2/13 has 4 buses an hour off-peak. Same with the 3/4, and the 15/18. Add another 3 buses an hour from the 1 and 16, and that’s 15 buses an hour, or one bus every 4 minutes, even off-peak. During peak, you can pretty much blink and you’ll see a bus. And further south, you also get the 5, 26, 28, 358, and lots of other less-frequent routes. At that frequency, the transfer penalty is almost zero, unless you’re particularly averse to taking two vehicles. And, with the recent service consolidation, all of these routes use the 3rd Ave corridor, which means there’s no question of where to wait. The only other corridors in the city with anything close to that kind of frequency are 3rd Ave through downtown, and Pine between Broadway and downtown. If anything, I’d rather see some of these routes moved *away* from Belltown/downtown, and the resources directed towards other corridors which are dramatically underserved (e.g. Broadway, U-District/downtown via I-5, 12th Ave, Denny). In my mind, there’s simply no good reason for Belltown to have a bus every 1-2 minutes at peak, when Denny and Broadway are stuck with one bus every 15 minutes. I can tell you don’t actually use the busses in Belltown or you’d know that it’s more like about three busses in a minute and then nothing for ten. All the busses through Belltown are blockbuster performers and serve multiple dense neighborhoods. We need to kill or scale back poorly performing routes rather than robbing one dense neighborhood in favor of another. I’ve ridden them on occasion, but you’re right, I’m not a regular rider. That said, this suggests that there’s some low-hanging fruit. If 3rd Ave in Belltown was transit-only for one or both lanes, and if the bus schedules were rejiggered ever so slightly so that buses were staggered through Belltown, then all of a sudden, you’ve improved from 10-15 minute headways to 5 minute or better. That’s not to say that a 1st Ave streetcar wouldn’t be worthwhile, but a dedicated transit lane on 3rd would be much cheaper and could happen much sooner. Completely agreed. I’m just saying, when I think of corridors that desperately need more bus service, 3rd Ave in Belltown isn’t nearly as high on my list as, say, Broadway, or N 45th. Nice! This is hopefully the first of more bus-only lanes to come. While a poorly implemented bus-only lane can create problems for both cars and transit riders, I tend to side on laying the paint and adjusting it later if it doesn’t operate as expected or traffic patterns change. I seem to recall we had this debate on twitter already. Do the math: on a mile of wire required per rider basis, the 48 slams every other route in the system, followed by the 11. The 26 and 28 aren’t even frequent service routes, and the 5 splits at 105th, forcing us to electrify two non-frequent segments. Why are you pushing to electrify these routes when are far more cost effective places to spend that money? I’m not pushing specific routes really; I just want us to move toward an all-electric network. I absolutely want to wire the 48 and 11, though Madison Park disliked the wires and deliberately got them taken down. Putting them back would be no easy feat, even if it would greatly simplify and improve both the 11 and the 12. Ah, well fair enough then, we agre. I’d like to see all our non-freeway busses electrified eventually, I guess my point is that for the moment we should focus our advocacy on things that are the most cost-effective, given that Metro and the city are broke. Some caveats: This data is old and thus understates the ridership on the 8, plus that bus will become much more important once U-Link opens and the MLK corridor starts to fill in; it’s really worth investing in. I also realize the 11 is through-routed, so electrifying it would add layover costs or require some creative restructuring. That said, it should be reasonably obvious that the 48 is the first major target in any electrification project, followed by the 11, if possible. The 48 is the highest ridership Metro route, and a very long one, with a drawbridge and a high traffic area in the middle. This makes it challenging to keep to a schedule. Metro may someday split the 48 (“Forty Late”) into a north half (UW station — Loyal Heights) and a south half (Brooklyn Station), which overlap in the U District. If this happens, which half would be the best candidate for electrification? I suspect it is the 48 south. Looks like about 2.5 miles from Thomas (where the 43 veers off) to Rainier Ave. where the trolley wire picks up again. What would the numbers be for that? My guestimate is about 1.6 miles of new wire, plus I think some switches would need to be added at the Mount Baker TC. The 48 is a slam dunk for electrification, to my mind. I have a hard time seeing the justification for the 8’s current route on MLK. It seems like the main reason it was extended to Rainier Beach was to avoid having an MLK route going downtown (which would have happened if the 42 had been made the main MLK route). But why not extend the 48 to Rainier Beach instead of the 8, as it used to do? The argument would be made that the 48 is already too long, but yes, that’s right, split it in the U-district already! North of Mt Baker, 23rd is just five flat bocks from MLK (28th), except right near Madison where it gets a bit steeper. So why two routes, especially when the 8 is horrendously slow. Are there really more people from south of Mt Baker going to Broadway or MLK/Madison rather than the U-district? Do we need two routes there? The situation will change again with University Link, which will be much faster to either Broadway or the U-District compared to the 8 or 48. So the main use of those routes will be to the in-between destinations, of which 23rd/Jackson is the main one. So why not bolster the 48 and truncate the 8 at Group Health or make it go Seattle Center – Madison Park? I don’t think you could justify two routes to Madison Park. Seattle Center-Denny-Blaine, maybe. It was actually the recommendation of the advisory group to extend the 48 instead of the 8, but Metro picked the 8 because it is more reliable. Splitting the 48 costs money that Metro doesn’t have. Actually, if Metro truncated the 8 it probably would have enough money. The 48 would only need to be extended a few miles at the non-trafficky south end. It already has 15 minute frequency so there’s no need to add runs. So there would be lots of hours available for an overlap in the U-district. I don’t understand. Both buses run every 15 minutes. I don’t see why you’d psave any money by having the 48 run the segment below Mt. Baker instead of the 8. Is there any chance we can get some paving or curbs that make it more obvious that bus-only lanes are different from general purpose lanes? It’s only a guess, but I suspect that kind of treatment both makes fewer drivers use the lane illegally and makes bus riders feel elite. Agreed. On Columbia where they’ve put in the bus-only lane, it just sort of springs up at drivers as they’re coming down the hill and many aren’t yet observing the bus-only lane. Maybe it’s just that it’s fairly new, but at least some striping would help. I think the right-turn-only-lane-onto-3rd thing there is a colossally bad idea, since 3rd is supposed to be transit-only. It would be better if that right lane ended via some white striping instead, so drivers are merging over instead of just not noticing the right-turn-only signs and continuing into what becomes a bus-only lane–or, alternately, discovering those signs at the last minute and turning right, thereby increasing traffic on the transit-only area on 3rd. “If we were going to install a lane dedicated to buses without adding any extra capacity for vehicle traffic, it would completely destroy the corridor in terms of vehicle traffic,” said Mike Boonsripisal of King County Metro.